"Filch isn't in a good mood - he's got the flu and some third years accidentally plastered frog brains all over the ceiling in dungeon five." Potions classes take place in one of the Hogwarts dungeons, where the air is cooler than the rest of the castle (PS8). Jars full of pickled “slimy things” suspended in liquids line shelfs around the walls (CS5). Possibly the same place as “Dungeon Five” where some “third years accidentally plastered frog brains all over the ceiling.” Harry often thought of the potions dungeon as “Snape’s dungeon” as opposed to the dungeon where Slytherin House was located. Location of Snape's office and the potions classroom. 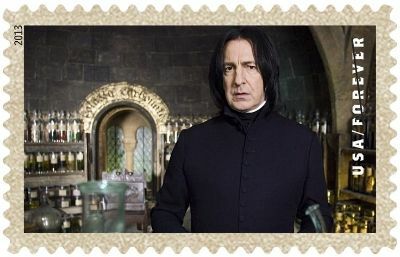 Snape in the Potions Dungeon with jars of ingredients behind him is featured on a United States "Forever" postage stamp (maybe it should have said "Always").